On Saturday, March 16, the House Human Services Committee held an all day hearing on two bills to keep Medicaid Expansion on the books in Montana. HB658, sponsored by Republican Ed Buttrey - who sponsored the 2015 legislation that brought Medicaid Expansion to Montana in the HELP Act - revamps the present law and expands government yet again. HB425, sponsored by Democrat Mary Caferro, also revises the present law. The HELP Act is due to sunset in July of this year. Both bills make Medicaid Expansion permanent. The Governor and all proponents have harped on endlessly about how the Expansion has been an economic boon to Montana. Don’t buy it. This program is nothing more than a shifting of extracted federal and state tax dollars from one column to the other, one ledger to the next, as it flows to medical services providers (with hospitals benefitting the most). The cost of Medicaid Expansion is high on every level. Extensive waste, fraud, and abuse was reported in the first year of Montana's program. The current federal government reports are no different. Pres. Trump’s latest budget calls for allowing states to choose between a per-enrollee cap on payments, or a block grant. Furthermore, he endorses the idea of repealing an expansion of Medicaid eligibility requirements enacted under Obamacare. Federal dollars will decrease significantly over time, no matter what. Where will Montana obtain the funds to offset the continuing decline while simultaneously taking on more enrollees? Last year Montana voters overwhelmingly rejected a ballot measure that would have further taxed tobacco products as the funding mechanism for permanent Medicaid Expansion. The disingenuous narrative of that loss by proponents is that the rejection wasn’t necessarily a vote against Medicaid Expansion itself, but rather a vote against the tobacco tax. Right. Medicaid in any form or iteration is not a constitutional function of government. While we have a moral and ethical obligation to help those among us who are truly unable to care for themselves, it is not within the constitutional purview of government to provide a broad-brush aid program to anyone who meets some level of eligibility it creates. At present, nearly 25% of Montana’s residents are enrolled in Medicaid or Medicaid Expansion. This is not sustainable. It’s time to sunset the legislation. 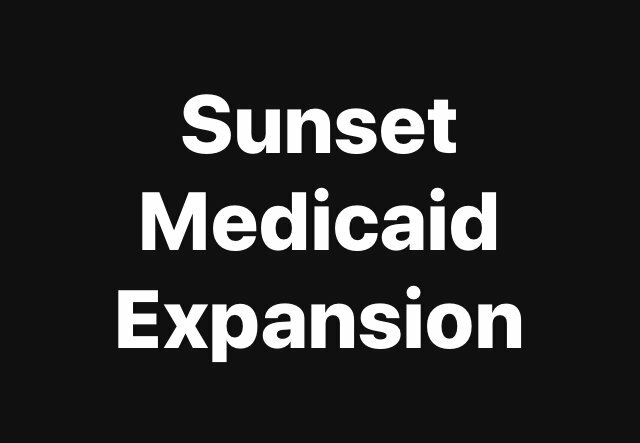 Please contact members of the House Human Services Committee, as well as your Representative and Senator, and urge them to say NO to continuing the Medicaid Expansion program in Montana, in any form.